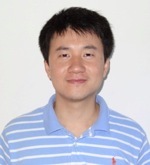 Dong Chen is now a Postdoc in Prof. Dave Weitz's group at Harvard University working on microencapsulation. In 2012, he graduated under the guidance of Prof. Noel A. Clark from University of Colorado at Boulder (CU) with a Ph.D. thesis titled “Nanostructures of Liquid Crystal Phases” and then stayed in the same group as a Postdoc for one year. His research interest focuses on the self-assembly of soft matter and the property associated with the self-assembled microstructure. In 2006, he received his B.S. degree of applied physics with a thesis about “Investigating the interplay of magnetic and ferroelectricity in magneticelectric multiferroics by substituting the Mn site of DyMnO3 with Cr ion” from University of Science and Technology of China (USTC) in China. After two years’ study at CU, he got the M.S. degree after passing a comprehensive exam on the topic of “Investigation of the Faraday instability” in 2009. A c=50 wt% MHOBOW/8CB mixture was cooled down from isotropic. MHOBOW first phases separate from the isotropic, forming the B7 and then the B4 phases. The sample is subsequently quenched at 60ºC, where 8CB is still isotropic. Though the B4 phase may form parabolic or toric focal conics near the substrate, the FFTEM image shows a mosaic texture formed by the MHOBOW B4 phase. 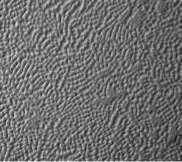 How the bent-core liquid crystal molecules self-assemble into this kind of microstructure is still a mystery. The width of the image is 3 μm. Jury comment: The most charming aspect of LC research is that you can use many ways to see beautiful LC directly. From polarization microscope, you see the colorful pattern; by FFTEM, the arrangement of the LC molecules cannot hide. It gives us a chance to understand the different LC phases. The feature picture of this month tries to show the B4 phase, which was not seen before.